America is losing wealth far faster than any other nation on earth is. In fact, since the mid-1970s there has been a transfer of wealth of almost 8 trillion dollars from the United States to the rest of the world. Sadly, most Americans have no idea what is happening. Most of them are completely unaware that America is being transformed from a wealthy nation into a poor nation at breathtaking speed. Most Americans just assume that America will always have the largest economy on earth and will always be the wealthiest nation on the globe. Unfortunately, just because something was true in the past does not mean that it will be true in the future. Right now, the United States is bleeding wealth at a pace that is almost unimaginable. Every single month, tens of billions of dollars of wealth is permanently transferred from the American people to the rest of the world. That means that the overall economic pie is shrinking. While the rich and the poor are busy fighting over the distribution of wealth in this country, the size of the pie that they are dividing up is continually getting smaller. America is poorer than it was last month, and next month it will be even poorer. If this continues, it will result in a complete and total economic nightmare. Let's break this down to a real simple example. Imagine that you are playing a game with a whole bunch of people, and you have been chosen to play the role of the United States. So you go stand on a giant map of the United States and you are given much more money than anyone else in the game. However, with each turn 50 billion dollars is taken out of your pile of money and is given to the other players. 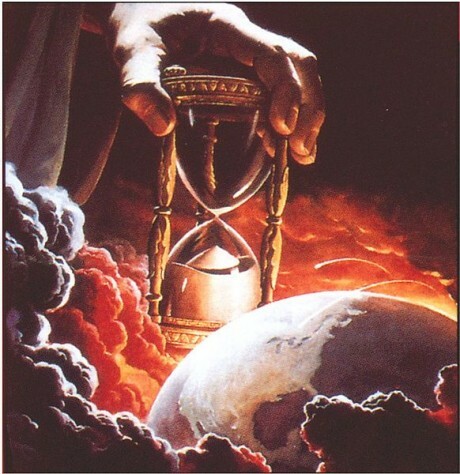 What is going to happen eventually? Yes, that is right - you are going to run out of money at some point. In order to continue playing you will need to borrow more money from the other players or you will need to print up some more money. In January, the U.S. trade deficit with the rest of the world hit 52.6 billion dollars. That means that we bought 52.6 billion dollars more stuff from the rest of the world than they bought from us. That 52.6 billion dollars is gone and it is not coming back. Next month another 50 billion dollars will leave the country. Imagine a giant hourglass filled with dollar bills. Dollars are pouring out of the United States and into the pockets of foreigners at a pace that is absolutely astounding. In 2011, the U.S. trade deficit with the rest of the world was about 560 billion dollars. We have a trade imbalance that is more than 5 times larger than any other nation on earth has. That means that we are getting poorer at a far faster rate than anyone else is. Most of the money that we spend does not even do any lasting good. For example, a huge chunk of our trade deficit is spent on importing oil. Once we burn that oil up in our cars it is gone for good and we have nothing to show for it. But the people we sent our money to end up with bulging bank accounts. How in the world do you think those oil barons build those outrageous palaces and are able to afford those exotic car collections? They buy all those things with the money that we sent to them. Meanwhile, our once great major cities are degenerating into festering sores. 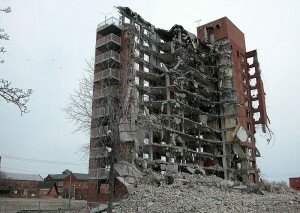 Our foolish policies are causing our own destruction. Another reason why we have such a huge trade deficit is because of our trade relationship with China. Our trade deficit with China was approximately 26 billion dollars during the month of January. For the entire year of 2011, our trade deficit with China hit a grand total of about 295.5 billion dollars. That was the largest trade deficit that one country has had with another country in the history of the world. Back in 1985, the U.S. trade deficit with China was only 6 million dollars for the entire year. In 2011, our trade deficit with China was more than 49,000 times larger than it was back in 1985. Have you ever noticed that it seems like half the stuff we sell in our stores says "Made in China" on it? Well, that is because China is wiping the floor with us on the global economic stage. 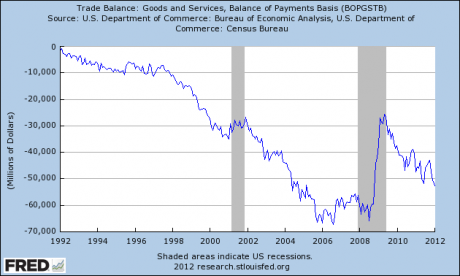 Today, the U.S. trade deficit with the rest of the world is about 5 times larger than it was back in 1996. That means that we are getting poorer as a nation at a rate that is 5 times faster than back in 1996. All of that money that is going out of the country could be going to support jobs and businesses inside the United States. But instead we have been losing jobs and businesses over the past decade at a rate that is absolutely amazing. According to U.S. Representative Betty Sutton, an average of 23 manufacturing facilities a day closed down in the United States during 2010. That means less jobs for American workers. Right now, there are approximately 6 million fewer jobs in America than there was back in December 2007. Because there are not enough jobs, we now have millions of working age Americans that simply cannot take care of themselves. But it isn't just jobs that we are losing. There are a whole host of other statistics that show that economic conditions in America continue to get worse and worse and worse. An all-time record 46.5 million Americans are on food stamps and poverty continues to explode all over nation. Instead of addressing the root causes of our problems, our leaders continue to support our false standard of living by borrowing gigantic piles of money. In many instances, we go back to the very same people that we sent our money to and we beg them to borrow it back. Debt always makes you even poorer in the long run. Anyone that tells you that America is in good shape financially is lying. Just look at that chart. Sadly, the truth is even worse than the chart shows. 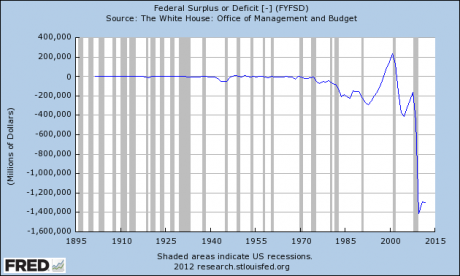 For example, there never was a "surplus" under the Clinton administration. The U.S. government simply stole money from Social Security and used a bunch of other accounting tricks to make things seem a lot better than they were. And the U.S. government is still using all sorts of accounting tricks to hide the true size of the national debt. If you doubt this, just read this article. If the U.S. government was forced to use GAAP (Generally Accepted Accounting Principles), the U.S. budget deficit would be far larger each year. But it is not just the federal government that is drowning in debt. *Harrisburg, Pennsylvania has announced that it will be skipping debt payments. *Stockton, California is on the verge of becoming the largest U.S. municipality to ever file for bankruptcy. For years, our politicians borrowed immense amounts of money to make up for all of the wealth that we were bleeding as a nation. But now we are absolutely drowning in debt and all of this reckless spending is not going to be able to last much longer. When all of this reckless spending ends, our false prosperity is going to disappear. Did you know that the U.S. national debt is growing by about 150 million dollars every single hour? 150 million dollars an hour is being stolen from our children and our grandchildren so that we can maintain our false standard of living. Most Americans expect things to get back to "normal", but the truth is that "normal" has left the building. Our transition from being a wealthy nation to being a poor nation continues every single day, and our politicians are doing nothing to stop it. Enjoy these good times while you still can, because they are not going to last too much longer. The debt bubble we have been living in is going to burst, and when it does we are going to get hit with a cold dose of reality. Last edited by AirborneSapper7; 03-12-2012 at 12:11 PM. Competition helps both sides, she says. A Buffalo deal yielded a few jobs. BUFFALO, N.Y. — To many labor unions and high-tech workers, the Indian giant Tata Consultancy Services is a serious threat -- a company that has helped move U.S. jobs to India while sending thousands of foreign workers on temporary visas to the United States. Joining Tata Consultancy's chief executive at a downtown hotel, Clinton announced that the company would open a software development office in Buffalo and form a research partnership with a local university. Tata told a newspaper that it might hire as many as 200 people. The 2003 announcement had clear benefits for the senator and the company: Tata received good press, and Clinton burnished her credentials as a champion for New York's depressed upstate region. But less noticed was how the event signaled that Clinton, who portrays herself as a fighter for American workers, had aligned herself with Indian American business leaders and Indian companies feared by the labor movement. Now, as Clinton runs for president, that signal is echoing loudly. Clinton is successfully wooing wealthy Indian Americans, many of them business leaders with close ties to their native country and an interest in protecting outsourcing laws and expanding access to worker visas. Her campaign has held three fundraisers in the Indian American community recently, one of which raised close to $3 million, its sponsor told an Indian news organization. But in Buffalo, the fruits of the Tata deal have been hard to find. The company, which called the arrangement Clinton's "brainchild," says "about 10" employees work here. Tata says most of the new employees were hired from around Buffalo. It declines to say whether any of the new jobs are held by foreigners, who make up 90% of Tata's 10,000-employee workforce in the United States. The Tata deal underscores Clinton's bind as she attempts to lead a Democratic Party that is turning away from the free-trade policies of her husband's administration in the 1990s and is becoming more skeptical of trade deals and temporary-worker visas. Like many businesses and economists, Clinton says that the United States benefits by admitting high-tech workers from abroad. She backs proposals to increase the number of temporary visas for skilled foreigners. The Tata deal shows the difficulty of proving concrete benefits to U.S. workers from the visa system. Since 2003, the year its Buffalo office opened, Tata and its affiliates have sought permission to bring more than 1,600 foreign high-tech workers to the state, including at least 495 to the upstate region and 45 to Buffalo, according to government data. Tata has brought additional workers into the country under a second visa program whose numbers have not been disclosed. Some U.S. worker organizations say Clinton cannot claim to support American workers if she is also helping Indian outsourcing companies and proposing more worker visas.